JERMY'S JOURNAL: Don't get mad, get active!!!! Don't get mad, get active!!!! Well there we have it folks! I lost - albeit by 1!!! I have known for weeks that it would either be myself or UKIP that wins the seat, and they won. Their 814 votes to my 813. That result also made UKIP the official opposition on Norfolk County Council with their 15 seats to Labours 14. Despite the loss, I actually feel OK about the situation. Years spent working on local issues, days and days spent campaigning over the last few weeks - I knew that myself, and the people closest to the campaign did everything we possible could and therefore I have absolutely no regrets. I've already been through so many 'what-if' scenarios in my head - but at the end of the day, a loss is a loss! and we did all that we could and there is no point dwelling on the situation. 1. The complete collapse of the Conservative vote: They polled 882 votes in 2009 - this time around they got just 353 - I would imagine that a very significant number went to UKIP. A similar story for Thetford-East - where previously over 1,000 votes were polled, compared to just 502 yesterday. I am sure that the absence of local candidates assisted angry Conservatives in moving across to UKIP on this occasion. 2. The complete collapse of the Liberal Democrat vote: They polled 934 votes in 2009, and won the Thetford West seat. This time around they got just 122 votes! I am sure that the fact that Mike Brindle did not stand again would have had quite some impact. He polled 99 votes alone for the Abbey Ward District by-election just last September and that's under half of the area for Thetford-West. On Saxon Ward not so many years ago Lib Dems were polling 300-400. For the Thetford-East seat there was a similar story, where Margaret Rutter in 2009 polled 665 votes coming in 2nd, this time around Bodo Rissman (or Frodo as he was called by somebody) polled 63 votes - 63!! the Green candidate got more than that with 85! 3. Other parties: The first time a Green has stood for Thetford-West....ever? or for a long time. Still, they only polled 64 votes - were they ex Lib Dems? or were some of them previously Labour? 134 votes for Carl Clark, Christian People's Alliance candidate - I'd imagine many of those were previously Labour votes for sure and a bulk of them would have come from the Abbey Estate area as that is where he is most known. What of those 12 spoilt papers!? 3 of them for accidentally / intentionally (we'll never know) voting for more than one candidate and therefore voiding the vote. I think all three had a cross in the Labour box - but also a cross in another. Many people get confused that they can vote for 5 candidates for town, 3 for District and just 1 for County. Of the 9 that voted for nobody, would they have voted if they had thought that UKIP would win? I was pleased to have increased my vote from 706 in 2009 to 813 this time around despite the fact that many Labour people would have crossed over to UKIP. Time and again people came to my local polling station (Pine Close) and say "Terry, if it wasn't for you, we would be voting UKIP" - and I am so very grateful for them sticking by me and having faith. UKIP won due to national concerns about the Conservative led Government and a media obsessed with talking about UKIP and giving positive publicity - both TV and newspapers. People have genuine concerns about immigration etc. and turned to UKIP for salvation rather than seeing any other party as the answer - and that needs to be acknowledged and addressed. I respect peoples verdict. I don't agree that UKIP are the answer - but, I respect peoples choice to vote for them. Mr Jermy, Labour leader on Breckland Council who lost agonisingly in Thetford West, said: “I worked as hard as I possibly could so I have no regrets. I was born on that estate and lived there the whole of my life and worked so hard and we still got defeated on national issues. I’m disappointed. “On the door step I rarely heard people talk to me about immigration. People were talking about their local community and in the vast majority of cases they were respectful of the work I had done. I'd like to pass on my congratulations to Peter Georgiou, as I did on the day, and wish him well in his role as a Councillor. I'd also like to thank the other candidates for standing and congratulate them for the votes that they secured. We had a very active campaign - particularly from myself for Labour and from Tristan Ashby for the Conservatives. I hope that Tristan will find his way onto a Council soon, probably Breckland, where I am sure that he will have a very worthwhile contribution to make. The harder Tristan worked - the harder he made me work! I may have lost by 100 instead of 1 if it wasn't for the effort that he put in. At times the campaign became too personal, which is always sad, but is testament to the passion on all sides. So what now??? My absolute main message to people has been and will be - DON'T GET MAD, GET ACTIVE!!! 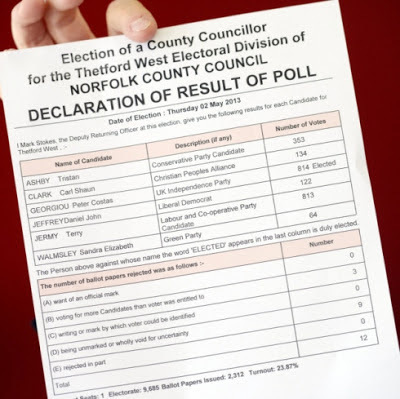 Just 23% of the Thetford-West electorate actually voted - something like 2,000 out of 9,000 registered. The importance of every single vote could not be more clearly demonstrated than in this result. Elections can be won and lost on a single vote - so make sure you vote every single time and make sure you do all you can to get everybody you know to vote. Also, get active in other ways. For a start - why not join a political party? I'd highly recommend the Labour Party (of course!) but failing that, join a party and stand up for what you believe in. If you are aged 14 - 26 then membership of the Labour Party is just £1 for the year. If you work 16 hours or less or are unemployed then is is just £1.88 per month. Get active by delivering leaflets, knocking on doors - all sorts!!! Had I have had a bit more practical help from the many people that I know support me, than who knows - I could have got those few extra votes. Don't want UKIP representing your community? then do something about it!!! May 2015 - a date for your diaries, the next set of elections - this time for Thetford Town Council and Breckland Council, with these results we could see our Town Council run by UKIP! and a VERY sizeable number of UKIP District councillors? Don't want that? then time to start doing something about it. I want the most amazing slate of 16 fantastic candidates for Thetford Town Council and 54 amazing Breckland District Council candidates - want to be part of the team? Then get involved now. @CllrTerryJermy absolutely gutted to hear the news! Labour are well and truly back on the map thanks to you in Thetford! Hang in there! @CllrTerryJermy Thanks Terry, you taught me alot for my next campaign. All the best in your next endeavour. We need more young councillors. @CllrTerryJermy - I don't support Labour but I'm sorry to hear this. Remember, plenty of people voted for you. @CllrTerryJermy SO CLOSE! A magnificent campaign. You showed us all in rural Norfolk that we CAN win if we do it right. Just wasn't to be. I think if I was @CllrTerryJermy I'd be the proudest person ever come win or lose - such a fightback in Norfolk because of his vision. Hi Terry, I can’t find the right words to express how sad I am you were not elected. I feel it was a total fluke. You were the right man with the right campaign and it is a tragic injustice to have to suffer that result please keep the faith and stick with it. I feel sure you are destined for great things and I look forward to the day when I can tell everyone yes well he used to live across the road from me before he moved to number 10! Okay Terry you lost by 1 vote, lets look at how we can make this a positive thing....lets come out fighting and make people see that UKIP is just the BNP in sheep's clothing, what we need to be doing is putting the facts of immigration to the voters not the sound bytes. I'm not the normally the most politically minded person, but seeing how passionate you appeared to be about our town this inspired me to vote for the 1st time, and im sure, the same thing applied to an awful lot of people as-well. Now is not the time to give in, its now the time to re-group and prepare for the next onslaught, im sure you have the backing of many in this town! Oh my word - Terry Jermy missed out by 1 vote. Whatever your political persuasion, no-one can ever doubt Terry's passion for Thetford. For those of you that don't vote but moan incessantly about what does/doesn't get done here - good luck! What can I say?! Disappointed in the people of Thetford. So devastated for Terry Jermy. The only person that actually puts his heart and sole into this town. If you didn't vote and you feel the need to moan about the failings of thetford...DON'T!! you haven't earned the right to. Your vote could have made all the difference!